Siebler, Inc. is a residential remodeling and historic preservation company serving customers in the Dallas - Ft. Worth community. Their portfolio contains an impressive array of projects that includes numerous kitchen and bath remodels, additions, new construction, ecclesiastical renovations, award winning historic preservation projects, and museum quality restorations. Ron Siebler, President of Siebler, Inc. has twice received ASID Dallas Design Community Designers’ Choice Award for Contractor/Remodel. In 2016, Preservation Dallas presented him with the prestigious Craftsman of the Year Award. Since 2014, he has received a total of nine Achievement Awards from Preservation Dallas, along with a special recognition award from Preservation Texas. With uncompromising standards, Ron brings together the finest tradesmen, artisans, and design professionals to realize the dreams and particular wishes of the client. His personal presence at the site and side-by-side involvement with his team provides each project with attentive management and timely completion. After years of hands-on experience, Ron has developed a philosophical, as well as methodical, approach to the work of residential remodeling and historic preservation. This perspective is derived from his belief that these trades and crafts reside within the genre of performed art. Consequently, Ron only works on one major project at a time, which permits him to be completely focused and dedicated to meeting the customer’s specific needs. Ron’s passion for old structures and machines dates to 1984, when he was involved with the first restoration of the Denton County Courthouse on the Square (circa 1897). His body of work as a historic preservationist includes numerous historic buildings, wooden wheel windmills, antique machines, and the preservation and recreation of hardware, furniture, and other artifacts. 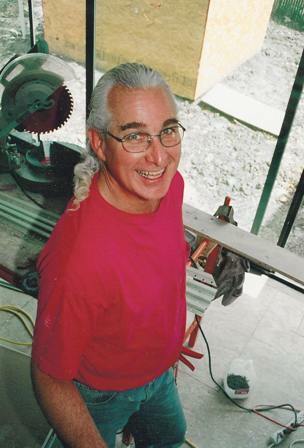 Siebler has specialized in performing his carpentry and blacksmith restorations at publicly attended demonstration projects using historic tools and methods in a museum context. With almost twenty years experience in third person interpretation, Siebler frequently volunteers as a Living History Interpreter at the Stuhr Museum in Grand Island, Nebraska. He also serves as the Resident Blacksmith at the Hopkins County Heritage Park, and volunteers at many other living history museums in the North Texas area. Siebler has built and contributed four playhouses to the Parade of Playhouses at Northpark benefitting Dallas CASA. His involvement with the community also includes three terms as a member of the Board of Directors for Promise House in Dallas, Texas. As a volunteer with the SAW Project (Servants At Work) of First United Methodist Church - Dallas, Siebler organized and supervised the repairs and renovations of over 50 Dallas area homes for poor and elderly residents. Ron has also assisted with flood and tornado relief efforts in Texas and Missouri. Ron holds a Historic House Certification from Preservation Dallas. Siebler, Inc. is certified by the EPA, and Ron is an "EPA Certified Renovator." He is licensed with several municipalities, including the City of Dallas, and he holds memberships in numerous institutions and organizations. David Lyles, friend and colleague says it best, "Ron Siebler is respected and admired by everyone in the Dallas area high-end residential market! He is voluminously experienced over decades of challenging construction and remodeling projects, thoughtful, approachable, and energetic to all those of us, clients and tradesmen alike, who have learned we can trust him to know the most elegant and artful solution from his experience, or to create that solution from his vastly creative mind! "